An interfaith statement claiming that Catholics and Lutherans are no longer divided on many key issues related to church, ministry and the Eucharist took another step forward on Aug. 10, when members of the Evangelical Lutheran Church in America (E.L.C.A) voted overwhelmingly to ratify the 120-page document. The vote to ratify “Declaration on the Way” comes just weeks before the Christian denomination begins a year-long commemoration of the 500th anniversary of its church’s founding by Martin Luther in 1517. Bishop Denis J. Madden, an auxiliary bishop for the Catholic Archdiocese of Baltimore, who co-chaired the task force that drafted the statement, was present in New Orleans for the vote. He was presented with a chalice as a gift from the E.L.C.A. “Declaration on the Way” was unveiled last year, and it compiles findings from 50 years of interfaith dialogue between the two churches in 32 “statements of agreement” on once contentious theological issues. The task force was created following a suggestion in 2011 from Cardinal Kurt Koch, head of Pontifical Council for Promoting Christian Unity, that the two denominations study the past five decades of interfaith dialogue to find where agreement had already been reached. Wednesday’s vote is another nod of approval from a key constituency, but the document does not rise to the level of church teaching for either denomination, and it is unlikely to do so without several more years of dialogue and reworking. The last major theological agreement between the two churches came in 1999, with the ratification of the Joint Declaration on the Doctrine of Justification. That said, both the Lutheran World Federation and the Pontifical Council for Interreligious Dialogue supported the task force, and earlier this year, the two groups published a common prayer that can be used by both Catholics and Lutherans to mark the Reformation’s 500th anniversary. Sister Susan Wood, a professor of theology at Marquette University, told America that the next challenge is finding positive reception in Lutheran and Catholic circles for the document. “This sends a message to the U.S. Conference of Catholic Bishops and the Catholic Church more broadly that there is a hunger and desire on part of E.L.C.A. Lutherans for closer relations with Roman Catholics,” she said from New Orleans in a telephone interview. The E.L.C.A. represents about 3.7 million members in the United States and the Caribbean. Sister Wood called Wednesday’s vote “wonderful” and “overwhelming” but said much work remains on the Catholic side of things. Bishop Madden said that he and other members of the task force plan to send a letter to other Catholic bishops alerting them to the “enthusiasm” surrounding Wednesday’s vote and encouraging them to reach out to their Lutheran peers in order to study the document, pray together and collaborate on social justice issues. The committee includes three Catholic and three Lutheran theologians, and it is co-chaired by Bishop Madden and Lutheran Bishop Mark Hanson. The state of relations between Lutherans and Catholics has captured the attention of Pope Francis, who is scheduled to mark the anniversary of the Reformation during a prayer service in Sweden on Oct. 31, the date Martin Luther is said to have nailed the 95 Theses to the door of a German church in 1517. The event kicks off a year-long commemoration of the Reformation by the global Lutheran Church, which includes more than 70 million believers. 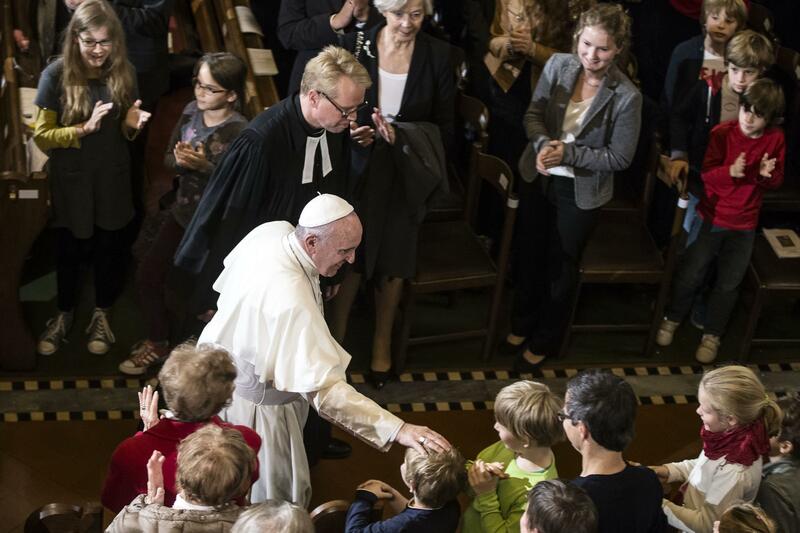 The pope raised eyebrows last year when he made comments some interpreted as a green light for a Lutheran married to a Catholic to receive Communion at a Catholic Mass, which church teaching prohibits in most cases. RELATED: Did Pope Francis Invite Lutherans into the Communion Line? The document also notes substantial disagreements remain between the two denominations, notably around the role of the papacy and the ordination of women, which the Catholic Church prohibits. Michael O’Loughlinis the national correspondent for America. Follow him on Twitter at @mikeoloughlin. Dear editor, it's 'ecumenical' not 'interfaith'. Lutherans are Christians, too! As a librarian, I'm pretty sure that this depends on which dictionary (or encyclopedia) you're consulting. I'm also pretty sure that like the question of whether "Jewish" is a religion or an ethnicity, the one of whether or not Catholicism is a denomination can be answered either way. What dictionary are you using, and what does it say...both to define "Catholicism" and "denomination"? Fine article. I'm glad to see our Catholic brothers and sisters paying attention to this effort. I'm an ELCA Lutheran and recently spent several weeks teaching Declaration on the Way in my congregation's adult Sunday School class. My only nitpick with the article is that Bishop Eaton is the head of the ELCA, not a body of bishops. The churchwide assembly is the highest decision-making body of the ELCA, and its voting members consist of both clergy and laypeople. It selects the head, currently Bishop Eaton, of the denomination for six-year terms. A conference of bishops meets more about twice a year and consists of regional bishops chaired by one of them, currently Bill O. Gafkjen of the Indiana-Kentucky Synod (ELCA Lutherans call our regional adjudicatories synods). A church council consisting of laypeople and clergy serves as the ELCA's board of directors, so the council of bishops serves more of an advisory role. You can learn more about all this by going to the following URL and clicking on the various bodies on the sidebar at the left side of the page: http://elca.org/About/Leadership. Also, I encourage everyone to review the document. It's lengthy, but at least the summary is worth some study. Although it isn't a formal agreement, it is a summary of formal agreements made around the world over the last fifty-plus years of Catholic-Lutheran dialogue. Huge problem is the ELCA is an extremely liberal body. They have women clergy, promote abortion, have altar and pulpit fellowship with bodies like the Methodist Church, United Church of Christ which have no theology at all. How can you agree with someone when you don't have anything to agree on. The RCC would be smarter to talk with conservative Lutheran churches and not liberal social organizations like the ELCA. I believe that the versions of the Lutheran Church you would have RCC work with would have nothing to do with the Catholic Church. They barely talk with other Lutherans -- at least in my community. I'm sorry to read this. It's true, old habits can die hard. We CAN work and worship together, it will certainly make our faith credible to those who would challenge the intention. Luther did not found any Church. Jesus Christ and Jesus Christ alone is the Founder of the Christian Church.